Following his appearance at the London leg of ‘Back To The Phuture – Tomorrow Is Today’ earlier this year, JOHN FOXX & THE MATHS will be performing material from their highly acclaimed album ‘Interplay’, along with classic songs from the early ULTRAVOX catalogue and JOHN FOXX’s solo career on a UK tour this October. Foxx will be joined on-stage by Benge (keyboards, percussion), Serafina Steer (keyboards, bass) and Hannah Peel (keyboards, violin). ‘Interplay’ is possibly JOHN FOXX’s most complete and accessible body of work since his classic ‘Metamatic’. With its exclusive use of vintage synthesizers, it possesses a mechanised charm while simultaneously adding a correlative warmth. The Quietus described it as “One of the finest electronic records you’ll hear in 2011”. In a break from extensive production rehearsals, JOHN FOXX kindly talked to The Electricity Club about the tour preparations and recalls his first ever solo shows. The band is more streamlined for this tour than the shows at The Roundhouse and The Troxy. How will the rhythm tracks be handled for this tour? Benge will play Roland and Simmons percussion over CR78, 808 and LinnDrum loops. Got a lot of strings to his bow, that boy. Have you decided which of the vintage synths you will take out on the road? Not quite, weight and size are crucial on aircraft, and there aren’t many wee analogues, unfortunately. The Korg Mono/Poly is definitely in, that’s a blinder and Benge uses it all the time. My old Roland Vocoder Plus has a very useful strings section for the odd bits of polyphony and Serafina seems to enjoy working with that and the Korg MS20. Maybe we’ll use the Juno 60 as well, it’s got more memory than any of us. We’ll try various combinations out in rehearsals. You have the multi-talented Hannah Peel on board. How did you first hear about her and what will she bring to the JOHN FOXX & THE MATHS live sound? Multi-talented is right – photogenic too. She was working on her album down at Benge’s studio, with Mike Lindsay producing. I liked what they were doing as I passed their bit of the studio, so we got talking. We have to get her playing some nice Velvets distorted electric violin on a couple of tracks… I know Cale did viola, but you know what I mean. A strong bit of THE MATHS concept is those Exploding Plastic Inevitable film clips from 1965. Hannah looks as if she just walked out of that. What of Hannah’s work would you recommend the curious to check out? ‘The Broken Wave’ on Static Caravan. You’ve also been working in the studio with Tara Busch? Benge always seems to work with interesting women. Serafina Steer, for instance, also made a fabulous album there. He played a song of hers to me in the studio one day and I was transfixed. We knew we had to get her to play with us. Then Tara came over and devastated us all with her voice and musical abilities. Nothing she can’t do. Karen Carpenter appeared, along with Nico and Doris Day. Then Bob Moog wandered in. You can only look on in awe. So who will you be having as your support act? Tara Busch, then Xeno & Oaklander. How good is that? All such brilliant, brilliant people. We got lucky all round. Which have been the key tracks from the ‘Interplay’ album for you personally and why? Oh, ‘Watching A Bulding On Fire’, ‘Catwalk’ and ‘A Falling Star’ I think. ‘Watching A Bulding On Fire’ – Because I got to work with Mira Aroyo. Wanted to do that for years, but the context had to be absolutely right. Then we were suddenly making the right record in the right place and Mira happened to be in London during that period, so we got lucky. It all turned out beautifully, thanks to her. Just right… very satisfying. ‘Catwalk’ – I had this sound in my head after coming back from New York, sort of GrungeElectroVelvets. Managed to get the right sort of filthy riff, then Benge put that old compressor on the vocals and we suddenly got live feedback squeals. Perfect. We just grinned and got on with it. ‘A Falling Star’ – I got to play this ancient 1970s Crumar that had the right sound, every time I touched the thing there was a new song. It was like finding some kind of sÿance unit in a pawnshop. Bit scary, but beautiful. The sound of lovedust. 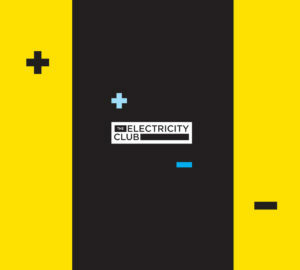 The Electricity Club happened to be at your first solo show at Hitchin Regal in 1983 and you even signed my ‘Golden Section’ lyric book mid-set! Do you have any particular memories of that first concert tour? Ha! That was the warm-up! It all seemed a bit dark and cavernous, but the audience was really up for it. Great fun. We went all over – Japan, too. Lots of very good memories, especially Spain. There was this marvellous club in Barcelona, full of the most beautiful models. I remember it well. What projects have you got on the go that we can look forward to? Paul Daley. He’s got to release these songs we did a couple of years ago, after he’d been working with Afrika Bambaata, I think. They seemed really good at the time; Extreme Electro. I’ve got a certain affection for one about walking through walls and another about glowing in the mirror. We got to some interesting places, Paul and I, with great efficiency. Suddenly, it feels like some global New Wave is going on at the moment. There’s a lot of people we like and urgently want to work with. They’re all so different, but you also sense a connection, some sort of emergent strata. One ever-developing project; the working title is ‘Alice In The Cities’, it involves Serafina Steer, Hannah Peel, The Smoke Fairies, The City of London, Benge, Steve D’Agostino and me. We’re also recording with, or in discussion with The Soft Moon, Robin Simon, LoneLady, Ghostbox, Tara Busch and Xeno & Oaklander. It’s a sort of global cross-pollination experiment – you hear their music and go – Bastards! Instinctively, you want to get yourself mixed up with all of ’em, just to see what happens. They pull you out of shape in all sorts of interesting ways, they’re that good. There’s some movies afoot with Macoto Tezuka, Jonathan Barnbrook and Karborn – and a documentary with Iain Sinclair. And this odd set of recordings made in empty rooms that turned up some interesting results. It seemed appropriate to combine them with some parlour piano pieces from one of the rooms. The project’s called ‘Electricity & Ghosts’. In among all this, I’ll be turning over a few tracks for Mira’s scrutiny. Benge is on the case at all points. He’s turned into Conny Plank visited by Stockhausen. Let’s hope Phil Spector doesn’t show up in there, or we’re all in trouble. Leamington Spa Assembly Rooms (13th October), Bristol Thekla (20th October), Manchester Academy 4 (21st October), Liverpool Stanley Theatre (22nd October), Glasgow Arches (23rd October), York Duchess (24th October), London XOYO (25th October), London XOYO (27th October), Holmfirth Picturedrome (28th October).